The Los Angeles Police Department is promising changes in the way it relates to the community, it announced just weeks after saying it would add more officers to South Los Angeles streets. About 40 community members were present to hear Los Angeles Police Department Chief Charlie Beck discuss the relationship between the city’s police and the community. The discussion, in the format of a breakfast, was held at the California African American Museum this past Friday. These types of forums began in 1999 to “[involve] minority communities in time-sensitive issues,” according to the forum’s website. On that Friday, the forum was discussion-based and then audience members asked questions to LAPD’s top man. 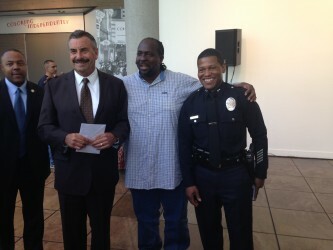 The LAPD has evolved in its relationship to the South LA community. More efforts are being made to not just police the community, but work as partners with it. The respected pastor who helped put out fires of the 1992 riots now fosters religious dialogue at USC. Since late November, residents from South Los Angeles have been peacefully protesting courthouse decisions to not indict police officers in Missouri and New York who killed two young unarmed Black men in the line of duty. For Rev. 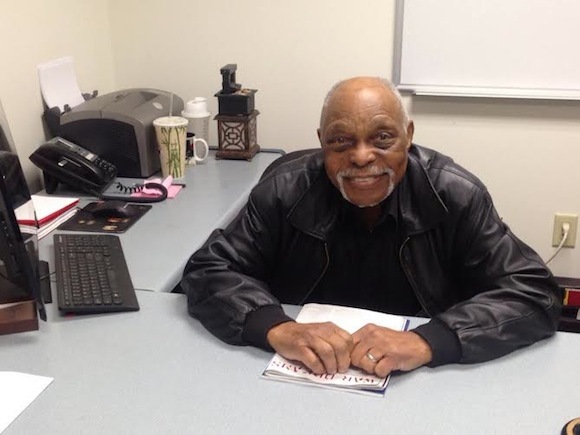 Dr. Cecil Murray, the former pastor of South L.A.’s First African Methodist Episcopal Church, the demonstrations in memory of Michael Brown and Eric Garner bring to mind L.A. protests of days gone by in that they aimed to shed light on the disconnect between police officers and the people they serve. Whether you agree or disagree with Dorner’s actions preceding his death or even how he died, one fact can’t be changed—he brought forth serious allegations of racism and discrimination within the Los Angeles Police Department. Dorner’s allegations have been publicly co-signed by both retired and terminated Black LAPD employees—and in private by those currently serving within the department but too afraid to cross the blue line. Many are asking, where do we go from here, but I’m more concerned with where we don’t go from here. To both the LAPD and the community—it can’t be business as usual. Town hall meetings and community forums to discuss a problem that we already know exists are a waste of time and accomplish nothing. Sure—the media will cover it and there will be no shortage of people coming forward to express outrage and mistrust towards the LAPD. The LAPD in turn will sit there and take the verbal abuse because quite frankly they’re being paid to be there and it’s what they do when there’s a surge of strong public outrage directed towards their department—and when it’s all over everyone will go home. But if it’s really a new day in the LAPD and the organization is as transparent as it tells us it is, then it’s time for the LAPD to sit down with the LAPD. That’s the discussion that needs to take place. Dorner’s manifesto wasn’t written to call attention to police brutality. He was trying to call attention to the systemic institutional racism and discrimination that he experienced as a Black police officer when trying to report police brutality to his higher-ups. He was trying to clear his name and blow the whistle on what is happening inside the department everyday, including today, to Black police officers. Don’t get distracted. You tell me what’s easier—investigating the firing of a dead ex-cop or addressing the issue of rampant racism in the department that was presented by the dead ex-cop. Dorner wasn’t the first Black police officer to lose it after separating from the department and as others have said, he won’t be the last unless something changes. According to the L.A. Times, the department denied that the reassignment was retaliatory, describing the move as part of an overall redesign of the training program. The incident marked the third time that the department’s high command has been accused of punishing supervisors who spoke out against the LAPD in closed sessions before the Christopher Commission. Nichols, in an interview with the The Times, said he’d suffered severe stress-related problems, including anxiety, insomnia and vomiting, since he was advised that he was being removed. “I can’t work. I can’t sleep,” he said. “There’s not one minute that I don’t think about it. Sixteen years of working in specialized units, doing my tasks, and now, because I’m honest and fair, they do this to me. Fred Nichols checked into a hotel that following May and shot himself. Retired in-good-standing sergeant Cheryl Dorsey recently came forward and explained how when she was going through her own Board of Rights hearing that involved the same charge as Dorner—giving false and misleading statements to an Internal Affairs investigator —she seriously contemplated just jumping off the third floor of the Bradbury Building. Married to another LAPD officer at the time, Dorsey says that she was a victim of domestic violence and after details of incidents at her home found their way into the department, she was charged with six counts of unnecessarily causing the response of an outside agency for the six calls she made to the sheriff’s department from her home in Altadena. The charge of giving false and misleading statements was tacked on when questioned by Internal Affairs. She believes that having come forward since Dorner and finally speaking out that she’ll face some sort of retaliation from the department. Fired LAPD police officer Brian Bentley said that he had a manifesto too—not a list of those to kill, but those who had wronged him during his 10 years with the department. He was fired for writing the book One Time: The Story of a South Central Los Angeles Police Officer, a book that documented his experience with racism, discrimination, and police brutality inside of the LAPD. And there’s another Black officer who has a lot to say but tells me that he’s too worried about his family to come forward. So you see, this time it isn’t about us per se—it’s about the Black men and women who have suffered over the years the type of racism and discrimination as described by Dorner and echoed by many of his colleagues in the days since. The community’s job is to push forward and stand with those Black police officers willing to come forward and give credence to Dorner’s claims. It’s very easy to discredit someone who’s never worn the LAPD uniform, but it’s not so easy when it’s one of your own, and that’s the discussion that needs to take place publicly. It’s the first real step towards ending police brutality on the streets and in the department. I want to see the relationship between Blacks and the LAPD improve and I believe that it has. But I also believe that we just took a huge step backwards with Dorner and no amount of community meetings with civil rights leaders and the LAPD posing for cameras is going to fix that. It can’t be more the same. Christopher Dorner was a game changer. Chosen as one of Essence Magazine’s 25 Women Shaping the World, Jasmyne A. Cannick writes about the intersection of race, politics, and pop culture. Follow her on Twitter and Facebook. The Los Angeles Police Department announced their new focus on eight new women connected to the Grim Sleeper. Six were missing persons, one was an unsolved homicide case, and the eighth woman is unidentified. Lonnie Franklin Jr., a South Los Angeles resident, was arrested last July for the killing of 10 south Los Angeles women. The youngest was 14 years old, and the oldest victim was 36. Since his arrest, police have collected evidence, including many photos, from Franklin’s home. Evidence led police to identify three missing persons who were at or near his home. LAPD detective Dennis Kilcoyne said two photo I.D.s were found in Franklin’s home, including one of Ayellah Marshall. She disappeared in February of 2005 at 18 years old. She was a senior at Hawthorne High School. Another I.D. found belonged to Rolenia Morris. It says she was from Las Vegas Nevada. With more women being identified through evidence, Kilcoyne said he doesn’t believe “Grim Sleeper” is still an appropriate nickname. “I think the more we find out, the more we’re going to fill in that gap,” said Kilcoyne. Police still have photos to comb through and identify, and are asking the community to take a look at them. They hope those frozen in the photos won’t have to be added to the Grim Sleeper’s victims list. Below is LAPD detective Dennis Kilcoyne talking about what his team has ahead of them. In the early morning hours of August 4, Jerriell and Sulema Wilborn were driving near the intersection of Slauson Avenue and Main Street. As they pulled through the intersection, the couple was shot multiple times by gunfire coming from outside of their car. To avoid further shots, 51-year-old Sulema Wilborn accelerated the car forward until she lost control, crashing into a nearby pole on the freeway off ramp in South Park. At 3:43 a.m., just minutes later, officials at the scene announced the couple had died. 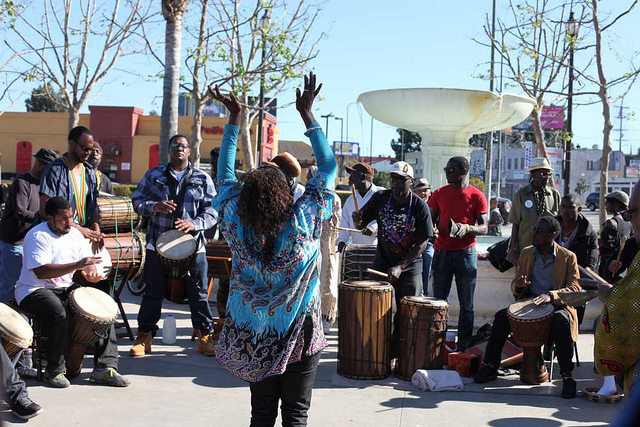 The Wilborns were well-known in South Los Angeles, as Sulema was a long-time activist who worked for celebrity lawyer Thomas Mesereau’s legal clinic and 49-year-old Jerriell worked with The Wrecking Crew Church’s community outreach program. After seven months, Los Angeles Police Department investigators David Torres and Louie Calzadillas have not found any suspects connected with the case. Family members have tried to come to peace with the loss of the couple. With the help of the Los Angeles City Council and Councilwoman Jan Perry, the police department announced today that a $75,000 reward would be offered to anyone with information leading to the identification and apprehension of any suspects in the case. It is unclear whether the double-homicide was gang-motivated, but officials believe fear could be a factor as to why the community has not come forward with new information. The hefty reward will be in effect for the next six months following today’s announcement. You can’t hear much on the video tape. But the pictures of a man on the ground beaten by a crowd of police officers startled the nation. His name was Rodney King – a name that would become synonymous with Los Angeles Police Department brutality. “When I watched the beating, it was a severe one. With a number of officers it just kept going on and on,” said Paul Skolnick, who worked as an assignment editor at KNBC at the time of the beating. His station was one of many that played the video shot by bystander George Holliday. For many African American residents, scenes of the beating touched a raw nerve. Daphne Bradford, a teacher in South Los Angeles, said it reminded her of the civil rights era. Four white officers were tried in the beating of King, when they were acquitted in April of 1992. 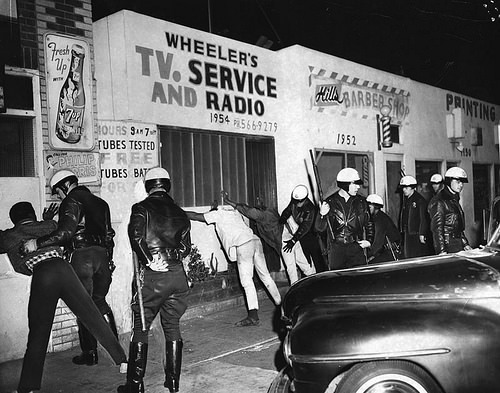 South Los Angeles and other parts of the city erupted in violence. Bradford remembers that at the time she was heading home from a heated community meeting at First AME church. After she made it through a fire that was like an inferno, she knew she would make it through the rest of the riots. The riots are painful memories for many Korean Americans as well. Ae Kyung Kang was living in Gardena. The family had an auto parts business. When the riots broke out her husband wanted to get a gun, but Kang didn’t want him involved in the violence. The trauma of having her business looted and eventually closed is still fresh. Civil rights activist Earl Ofari Hutchinson explains why Korean American store owners became targets in the riots. Kang’s family went back to Korea and lived there for many years. They eventually returned to the United States and now own a dry cleaning business in Torrance. Ethnic tensions and poverty, some of the things that led to the riots, still persist – but Police Chief Charlie Beck talked about what’s changed in the police department. “Inargulably we are a much better police department in the intervening twenty years,” Beck said. Beck said the L.A.P.D has an approval rating of 83 percent. In 1992, there were 90,000 violent crimes; last year, only 20,000. The police department has changed as well. The police chief has term limits and serves at the pleasure of the mayor. Jasmyne Cannick is a communications strategist in West Adams. She noticed changes in the L.A.P.D. “We see a lot more black officers in leadership, a lot more black female officers on the street,” Cannick said. Technology has changed things too, she added. 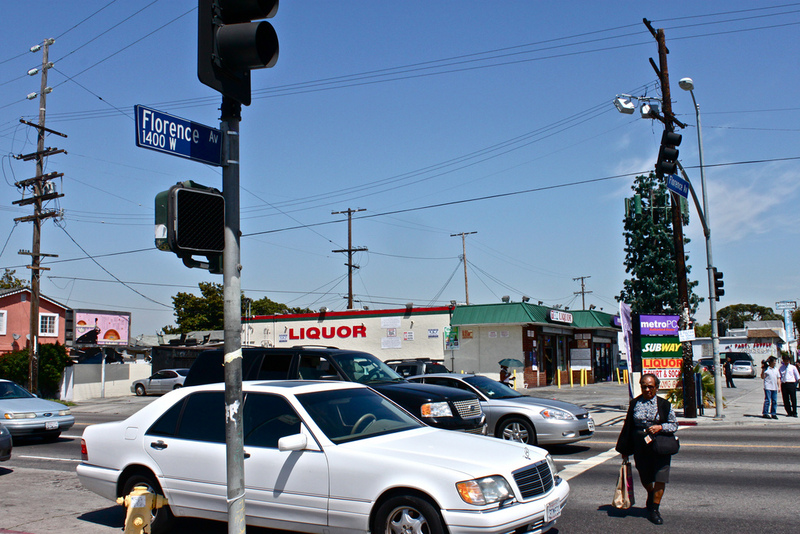 Bradford still sees the history of the riots when she drives around South L.A.
What do you remember of the Rodney King beating and the 1992 riots? We want to hear from you. After two hours of deliberation, a jury found in favor of a Los Angeles police officer in a wrongful death case brought by the wife of a man killed in the Crenshaw area Monday. Laura Michelle Cox, a Woodland Hills resident, sued Officer Jose Campos for excessive force in the shooting of her husband Maurice Cox on March 1, 2008. “I’m in total shock,” Cox said of the verdict and how quickly it was reached, according to City News Service. Cox argued that the 13 shots fired at her husband were excessive because the object in his hand that the officers perceived to be a weapon was, in fact, a cell phone. But the 9-3 verdict found against her. Cox said she and her lawyers are investigating a possible appeal. Maurice Cox was killed after crashing his truck near Crenshaw Boulevard on a night his wife said he had been playing dominoes with friends. Believing Maurice Cox was armed, several officers fired nearly 50 rounds at Maurice Cox, the fatal wound coming from a Los Angeles Police Department officer who was no longer in the case when it went to a jury. The shooting was captured on film by Alex Alonso of streetgangs.com and a service station security camera. The District Attorney’s office investigated the shooting but decided against prosecuting the officers involved. Los Angeles City Councilmember Jan Perry and members of the Los Angeles Police Department met Thursday at the Midnight Mission Homeless Shelter to raise awareness about how to channel efforts and resources to better help the homeless community. Perry recommended that people who want to give should donate through reputable organizations, like the Midnight Mission, the Union Rescue Mission and the Los Angeles Mission, rather than dropping off supplies directly onto Skid Row. “We’re encouraging people and groups who want to help the homeless to partner with local non-profits in Central City East to ensure that donations are distributed in a manner that is safe, healthy and that will have the greatest impact,” Perry sad. Orlando Ward, the program director at the Midnight Mission, said essential supplies in homeless shelters like his are distributed to hundreds of people in the community. Ward said this helps more people than just the few that might receive food and clothing on the street in the form of a handout. LAPD Captain Todd Chamberlain said that some of those unintended consequences can lead to desperate community members fighting over the resources handed out to them or dropped off on the streets. Chamberlain said those who volunteer their time or resources with non-profits like the Midnight Mission not only help those who are homeless in the short term, but they can help the homeless begin to live more fulfilling lives in supporting organizations that provide rehabilitation, medical and job training services. Happy and proud of his Spiderman costume, 5-year-old Aaron Shannon was getting ready for a Halloween party, when he was shot in the back of his head. The young boy’s death sparked anger in the community due to the heinous nature of the crime and the innocence of the victims. Detective Douglas Pierce is one of the main investigators on the case. 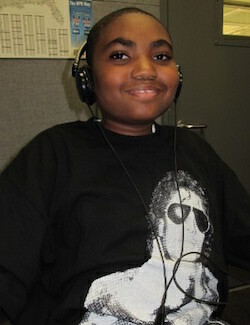 He says the Los Angeles Police Department was overwhelmed with the number of phone calls about the boy’s murder. The Los Angeles City Council and the Los Angeles County Board of Supervisors offered a $100,000 reward for information in the case. Marcus Denson, 18, and Leonard Hall, Jr., 21, both admitted members of the Kitchen Crips, were arrested last week. Despite their young age, both suspects have prior convictions. Denson was on probation for battery and criminal threats. Hall was on parole for a narcotic related crime. A viewing will be held Thursday, Nov. 11 at 5 p.m at the Simpson Family Mortuary, 5138 South Broadway, Los Angeles, CA 90037-3837. The funeral is Friday, Nov. 12 at 11 a.m. It will be at the City of Refuge Church, 14527 South San Pedro Street, Gardena, CA 90248.